What do you get if you mix two die-hard Borussia Dortmund fans, a couple of beers and a big field to play with? Why, a BVB-inspired crop circle of course! That's right, two Dortmund fans have taken their love of the team to new lengths by cutting the club's logo into a field of rapeseed in the town of Witten, approximately 13 miles south-west of the Signal Iduna Park. 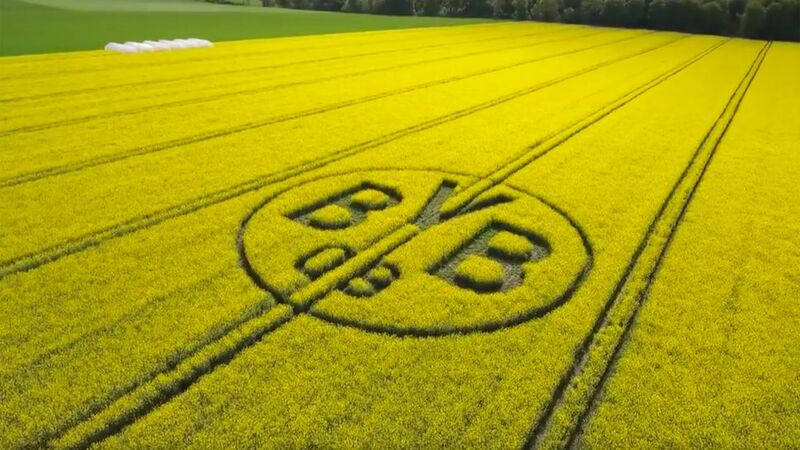 Watch: The story behind the BVB crop circles! "My boss had the idea to do it 15 years ago and had always tried to work out how to put it into practice," explained Robin Voigtländer with a smile. "Then one evening we were having a couple of beers and we came up with the idea. Peter [the owner of the field] was on holiday for a week so a colleague and I set about doing it. I'm delighted with the way it looks. It turned out brilliantly; I couldn't have imagined it better. It all came together as the combination of our hobbies of agriculture and Borussia Dortmund." So how exactly did they do it? "We found the Dortmund logo on the internet and printed it out," said Voigtländer's partner-in-crime, David Obenaus. "Then we got out our compasses and rulers and started calculating the dimensions and then converting that into the right proportions. Then we went out into the field and made the measurements and put in the markers." The finished article is the result of months of advance preparations, with the duo trimming down the appropriate sections of rapeseed long before it blossomed, needing 12 hours of work to complete a masterpiece that spans 34 metres in diameter.